The Hun School celebrated the grand opening of its newly renovated Middle School on Friday, September 22nd, with an all-school ribbon cutting ceremony. Eighth grader Isabella Gomez ’22 cut the ribbon as her fellow students cheered. The 19,000-square foot facility has twelve new classrooms, a robotics studio, 2 science labs, media and art rooms, and several large gathering spaces. Architects Clarke Caton Hintz re-configured the Buck Building, built originally in 1974, to be open, colorful, and filled with natural light. Classrooms were enlarged 80 – 100% and designed specifically for hands-on, experiential learning. 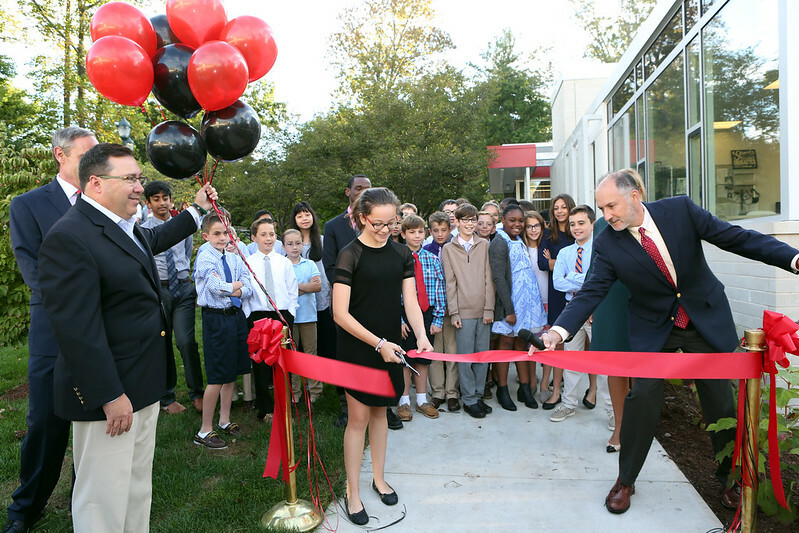 The $5.5 million renovation was spearheaded by the School’s Board of Trustees, Headmaster Jonathan Brougham, and Middle School Head Ken Weinstein and built by Scozzari Builders. Together, they envisioned a state-of-the-art learning space for the School’s youngest students that would also meet the growing demand for Middle School enrollment. “We know that 11- to 13-year olds learn best when they are moving and doing,” said Mr. Weinstein. “Our new building provides the space to do just that. 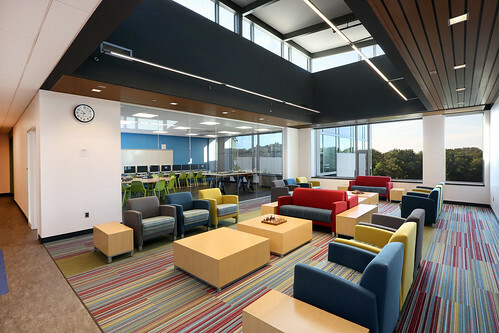 This renovation modernizes the space for contemporary education. Our math classrooms have tables that come apart depending on the configuration best suited to the project underway. They also raise and lower depending on whether or not the student prefers to sit or stand.” Another feature are whiteboard desktops where students can work on equations. “Our Humanities classrooms all incorporate Harkness tables. The Harkness method, designed by Exeter, encourages students to speak up, ask important questions, and collaborate with their peers,” explained Mr. Brougham “It is unusual at the Middle School level but, our students and faculty do really well with it." With a student-to-teacher ratio of 8 to 1, the Hun Middle School offers several unique programs that prepare students for Upper School study. They include an all-school debate program in which every student participates, a study-skills strategy class taken by every sixth grader, and a vigorous academic program that includes both traditional preparatory classes and interdisciplinary courses and projects.